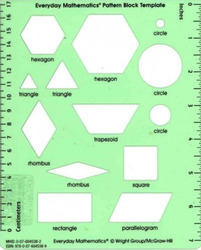 A clear, green, plastic tracing template contains a variety of geometric shapes with six of the shapes matching the sizes of the pattern blocks. Template edges include a 7" ruler on one side and a 17 cm ruler on the other. 6" by 7 1/2"